Unfortuantely there is not "one calendar to rule them all" for the area. Use our event highlights below in combination with looking through additional calendars. Night Life & Entertainment Venues - Entertainment and night-life takes place daily. This is the complete guide to entertainment for all the Russian River towns. Learn where the happening scenes are in the towns you will be visiting. Find theaters, bars, karaoke, and more. SonomaCounty.com - The calendar from the Sonoma County Tourism Bureau. Sonoma.com - Covers all of Sonoma County, search by month. Includes ongoing, weekly and monthly events. North Bay Bohemian - A week by week guide to what is happening and hip, although not all the events are in the Russian River area. Sonoma West Times - Good source for west Sonoma County / Russian River events and going ons. Press Democrat - Good calendar for Sonoma County; can search by date, location and event type. Misses some smaller but important events. Russian River Wine Road - Information on wine related events. Sonoma County Wineries Association - Events put on by member wineries. Gay Russian River - Learn more about Russian River gay travel. Russian River Valley Wine Growers - Wine, food and related events. Food, Wine, Music, History, Art and More! 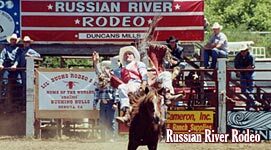 The Russian River is known for its big outdoor events, wine festivals, food festivals, music, sports and more. There are over 60 major events yearly and continuous special events.